July is the month of summer celebrations, including in this corner of south west France. Advertising notices drop into my email inbox about wine promotions, new books – including Saving our Skins, the latest book by Caro Feely who I mentioned in my last posting, – firework exhibitions, theatre productions, jazz concerts. It’s all there on offer over the summer months. Organizers work double time to attract and welcome tourists and local residents to their events. 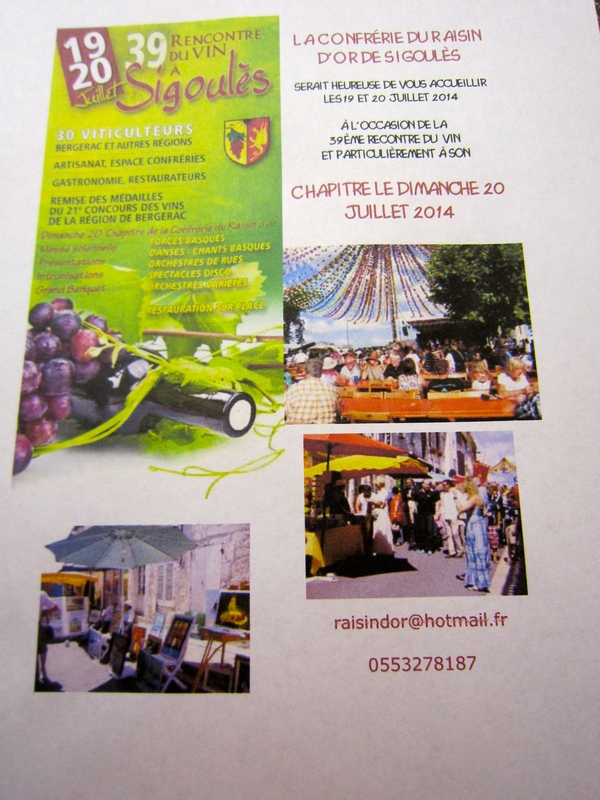 In the village of Sigoulès in the Dordogne volunteer members of the Confrérie du Raisin d’Or de Sigoulès prepare for their annual major event over the July 19 /20 weekend to coincide with the area wine festival. The wine fair and tastings are on Saturday July 19th, the parade of all the visiting Confréries and the annual general assembly or Chapitre on Sunday, July 20th..
A complementary series of guided walks and concerts organized by the Confrerie take place in the area during July and August. Adding to the excitement in the area this summer is that the Tour de France Stage 20 passes through the Dordogne and Bergerac the following weekend. 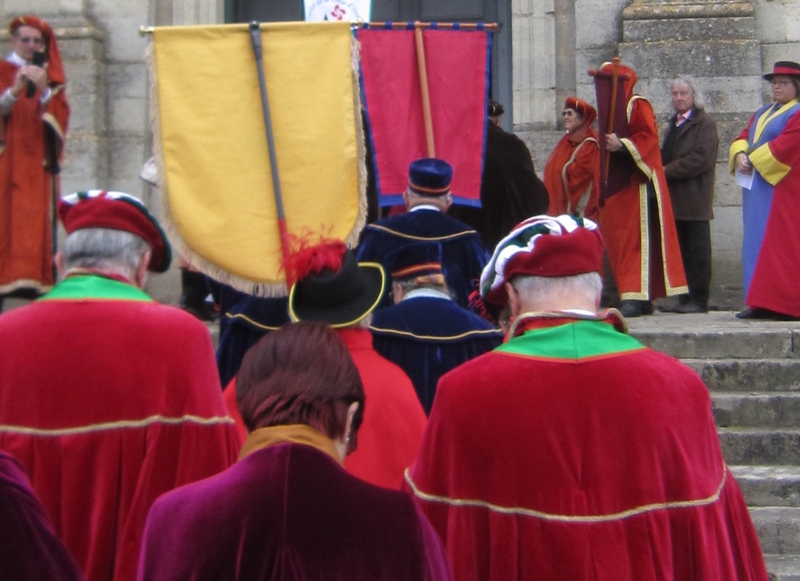 The Confrérie du Raisin d’Or is one of a large network of confréries or organizations of men and women across France whose objective is the promotion of their local area and culture as well as gastronomic products. The Confrérie du Raisin d’Or de Sigoulès particularly focuses on the wines of the area. The origin of these confréries dates back to the Middle Ages to the 12th and 13th centuries when occupational groupings were more likely called companies/corporations or guilds. Possibly the most famous of these early organizations was the “La Jurade de Saint Emilion”, created in 1199 and responsible for controlling many aspects of the wine industry in Saint Emilion (Bordeaux). Similar organizations of apprentices and masters existed until the time of the French Revolution when they were declared illegal in 1791 in the spirit of the free movement of labour. In the 20th Century, there has been a resurgence of local organizations or confréries which, by reinstating traditional pageantry, costume and ritual are celebrating the gastronomic heritage in the many different regions of France. Their existence has increased since the 1960’s with the development of tourism. The Confrérie Saint Emilionnaise took the name of “Jurade” in honour of the earlier organization when it was recreated in 1948. 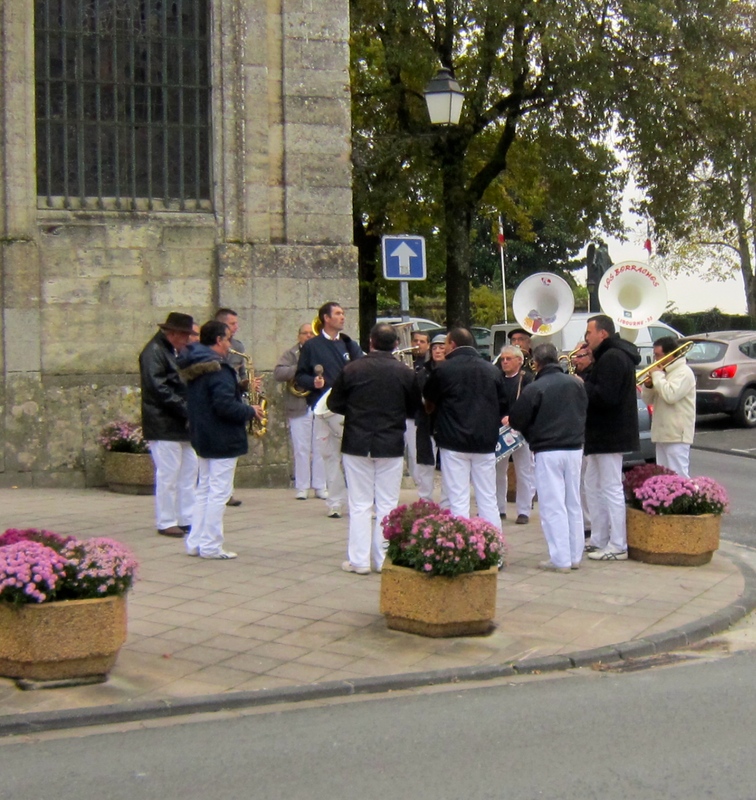 Confréries are generally linked to a tourism bureau, the local mayor’s office, local festival and/or agricultural initiatives as part of a broader promotional imperative. Not only are the confréries linked locally, they are also aligned regionally and nationally. For example, the Confrérie du Raisin d’Or de Sigoulès partners locally with the wine fair organization and local wine-maker communities: Foire aux Vins de Sigoulès and the Communauté de Communes des Coteaux de Sigoulès; regionally it is a member of the Chancelleries des Confréries d’Aquitaine, plus the Union des Confréries du Périgord and nationally is a member of the Conseil Français des Confréries. Sometimes, confréries twin with other confréries. 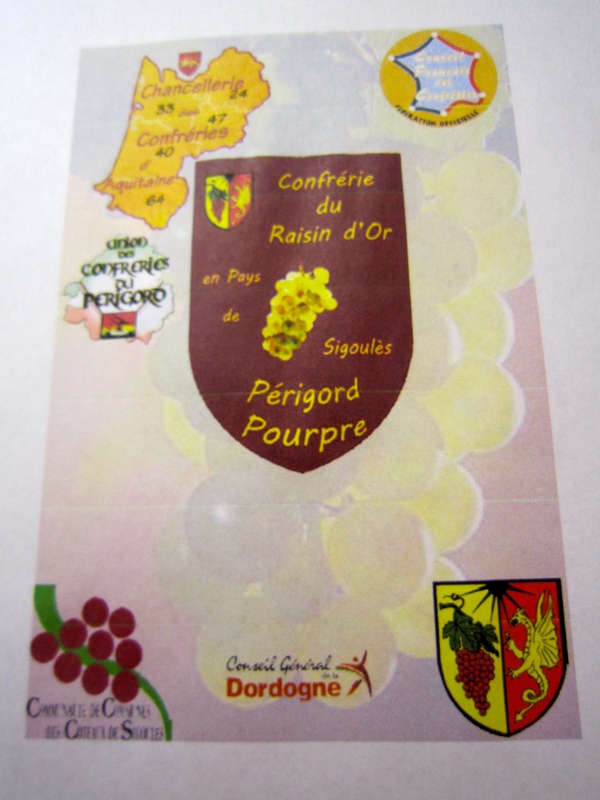 By way of illustration, the Confrérie du Raisin d’Or is twinned with the Confrérie du Pâté de Périgueux. I wrote about the pâté competition I attended last November in an earlier posting. Many different types of food and gastronomy are represented in the world of confréries: strawberries, cherries, pink garlic, fish, grilled food, mushrooms and so on. The gastronomic heritage of France is so highly valued that it has been recognized by UNESCO as an expression of Intangible Cultural Heritage and the confréries are included in that recognition. The Intangible Cultural Heritage (ICH) identification is promoted by UNESCO as a counterpart to the World Heritage designation which focuses mainly on tangible aspects of culture. A subtext of confrérie activities includes promoting economic opportunity in the areas through links to tourism. At the international level, some members of the Confrérie du Raisin d’Or de Sigoulès recently facilitated and conducted a series of events with local wines for Cuisine et Chateau, a Canadian organization from Calgary, Alberta which brings groups of visitors to the area each year for a week of culinary and wine experiences. Marnie Fudge, co-proprietor of Cuisine et Chateau mentioned to me that their experience was “fabulous” and they valued the professionalism and expertise of the Confrérie members they dealt with during their visit. As Canada works towards finalizing the details of its trade agreement with the European Union, it feels like we are making a small contribution to that effort! A comment about the word confrérie whose literal translation is brotherhood. In a 21st century context, I translate this to mean a group of men and women who associate with each other in a congenial way for a common purpose. A confrère in French means colleague which underscores this broader interpretation. Collegiality and congeniality in support of cultural heritage are core confrérie values. This all sounds quite serious, whereas the confréries and their events are also about the joyful celebration of culture with food, wine, music, pageantry and fellowship. This joyful celebration will be the cornerstone of the events in Sigoulès over the July 19 and 20th weekend and all the other events organized by the Confrérie du Raisin d’Or de Sigoulès and community partners in July and August. The confrérie events, whether this one in Sigoulès or similar events elsewhere in France are a wonderful way to learn more about the culture and history of France, local gastronomic products and, importantly, meet local people. I have attended several wonderful confrérie events where I’ve met delightful people. Last year, I was delighted to be invited to join the Confrerie du Raisin d’Or de Sigoulès in the role of Ambassadrice, one of two from Canada at present. The Ambassador initiative includes Confrérie members in other regions of France as well as other countries including Australia and Canada. My blog is about how wine opens the door to history, culture,food,science… For me, the Confrérie du Raisin d’Or de Sigoulès is one of those doors. 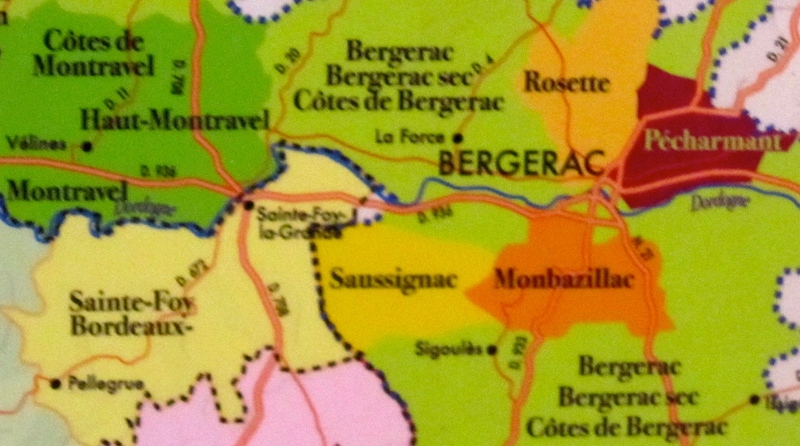 This entry was posted in Bergerac Wine Region, Confréries in France, culture, French gastronomic heritage, French Wines, History and tagged Bergerac wine region, Confréries in France, Cuisine et Chateau, Dordogne, French Gastronomy, French wine tourism, French Wines, South West France, Tour de France 2014, UNESCO, wine and culinary tours, wine tourism by elizabethsvines. Bookmark the permalink.